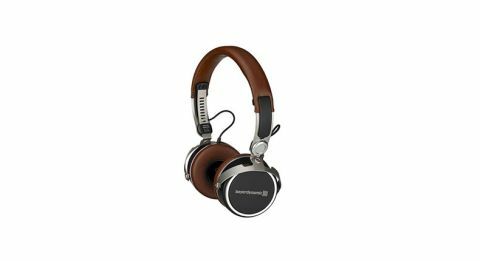 Beyerdynamic Aventho Wireless review | What Hi-Fi? When pitching the Aventho Wireless headphones, currently Beyerdynamic’s only wireless, on-ear headphones, the company is highlighting one feature over all others – personal sound profiles. Since we all hear differently, some people might need a bass boost or a lower treble to get the most out of their audio. Beyerdynamic provides that, through a companion app, by measuring how well you can hear frequencies and tuning your music specifically for your ears. The feature isn’t unique to these headphones, it will also be available in its upcoming Amiron Wireless headphones and the Xelento Wireless in-ears, but the personal touch certainly makes these an interesting proposition. The big question, though, is whether that’s enough to push the quality of the Aventho Wireless ahead of the competition? Out of the box, these headphones look noticably sleeker than rivals such as the Bose QuietComfort 35 IIs, and that is helped by the lack of traditional buttons. The Aventho Wireless are well made, feeling sturdy, luxurious and tight enough to block out much of the chatter in the street or the office, even though they don’t have active noise-cancelling, like in some other headphones at this price. In lieu of conventional buttons, Beyerdynamic has gone for touch controls, which are found on the right housing. To pause a song, tap twice. To turn the volume up, scroll from the bottom upwards (and vice versa). Skipping tracks forward and backwards is done with a swipe. However, balancing practicality with aesthetics is a more difficult feat, and we have to admit that we would prefer physical buttons. Touch controls simply don’t provide the same tactile feedback required to let you know your command has gone through, especially when you can’t see the surface you’re touching, and we occasionally find that the headphones don’t respond to our swiping. Rather annoyingly, should you decide to plug these headphones in via the 3.5mm cable provided, you won’t be able to control playback. The touch controls are connected to the headphones’ Bluetooth circuitry, so if you’re not using a wireless connection, or if your headphones are out of battery, you have to use the source device to select track or change volume. That’s unhelpful if it’s in the bottom of a pocket, or if you’re squeezed against passengers on a train. We can’t fault it for comfort though, and after a weekend of dedicated listening we are still ready for more. Unfortunately, they don’t fold down, so they’re a little more awkward to carry around, but there is a snazzy felt bag to make your journey easier. Underneath the sharp design, Beyerdynamic has included a lot of interesting tech. Top of that list is a companion app called MIY, or “Make It Yours”, with which you take a listening test before you use the headphones. Download the companion app and enter your birth year, and the headphones will run a test comprising a series of bleeps at different frequencies. Hold down a button on your screen when you hear the sounds, and the data received will allow the headphones to optimise the sound for your ears – accounting for the way we naturally lose the ability to hear high-pitched frequencies as we age, for example, or issues and differences in hearing ability between your left and right ear. It isn’t quite as straightforward as just listening to the beeps and, at six minutes, takes a surprisingly long time to complete, but taking the time to do it properly does make a significant difference to how your audio sounds. The data is kept in the headphones, so it will retain your sound profile even if you switch devices, but we found that both the latest iOS and Android versions of the app were a little hit-and-miss when trying to connect to the Aventho Wirelesses for the first time. Still, you should expect to see this technology in more headphones in future, both in Beyerdynamic’s products and other manufacturers such as Bragi. Once set up, we’re pleased to hear that Beyerdynamic has given the Aventho Wirelesses aptX HD Bluetooth-connectivity, which means you can play audio up to a 24-bit/48kHz resolution. The Aventho Wirelesses also have multi-point support, so you can connect two devices to the headphones at once. However, in testing, we found it difficult to achieve this, as it occasionally refused to connect to the second device. Battery life clocks in at around 30 hours, with the Aventho Wirelesses giving verbal feedback in 20 per cent intervals to let you know how much juice is remaining. We’d prefer it in actual time, though, as it’s a little frustrating when you put on the headphones with 40 per cent battery apparently remaining only for it to say “Low Power” 15 minutes later. But charging the headphones through a USB-C connection, rather than the older micro-USB model, is a welcome addition. Not only can it transfer power faster, those that want to take advantage of aptX HD Bluetooth will usually have a premium Android phone (most of which use USB-C) so you’re carrying one less cable about with you – unless you’re an Apple user. We run the headphones in for a few days, before pairing them to the Astell and Kern Kann for our first taste of their sound quality. We soon discover that the area in which the Aventho Wirelesses shine the most is its midrange. Playing Step Into My Office, Baby by Belle & Sebastian, the lightweight, floating lyrics are insightful and clear. These headphones do a great job of revealing the little details on sibilant sounds and the short breaths taken before longer lines. They manage this while keeping a firm grip on the frequency range – everything remains in its own place but is still suitably cohesive. The tonal balance is even, and resists the urge to overemphasise the bass for a grander sound, and nor is there any undue brightness in the treble. We try a classic track for testing high-end frequencies, AC/DC’s It’s A Long Way To The Top (If You Wanna Rock ‘n’ Roll), (using a MacBook and a Tidal HiFi stream) and the clear, forceful bagpipes are handled well. The Aventho Wireless headphones manage to keep the cutting edges in check. As the thick whine of the Scottish pipes presses ever higher, they tread a fine line between being able to convey the blaring, metallic character, but without ever being piercing. Moving to St Vincent’s Pills, the Aventho Wirelesses don’t shy away from giving a solid punch when needed. The bouncing, regular bass that comes in to balance out the weightless trickling sounds is right, popping into your ears with a natural, easy kick. But that’s not the only exersion of the low end that’s in the track; these headphones also manage to differentiate them with the other low-frequency beats that mesh together. From deep, droning hums to the occasional earth-moving rumble, and the faster, heartbeat-like palpitations that end in a tinnier crash, Beyerdynamic’s cans give each of these their own texture in a satisfyingly nuanced representation. The best thing we can say about the Aventho Wireless, is that they get out of their own way. You’ll be able to use them with a range of music and a variety of sources, safe in the knowledge that they provide a competant performance across the board which reveals the character of your music expertly. That said, there are some areas we’d like tightened up. Compared to the Bowers & Wilkins PX, the Aventho Wirelesses don’t have the same mastery over their dynamics. Playing Greater Than by Sharpless, the way that the drums fade into the song halfway through – which come out of nowhere in a series of rapid strikes to climax into something bombastic – isn’t as potent as we’d like it to be. They could also do with being a little tighter with their timing, and have a clearer sense of how the different elements of a track are layered on top of each other. These headphones make the instrumental strands sound a little congested, and don’t quite have the transparency to reveal the space around them. Beyerdynamic’s Aventho Wireless are well made headphones with a lot of good ideas behind them. The sound is insightful, and we like what the app brings to the table. We expect to see more of it in future, and it’s pleasing to see Beyerdynamic get ahead of the game. They’re still an impressive pair of headphones, but software bugs and a lack of sonic transparency stop them getting the full five stars.